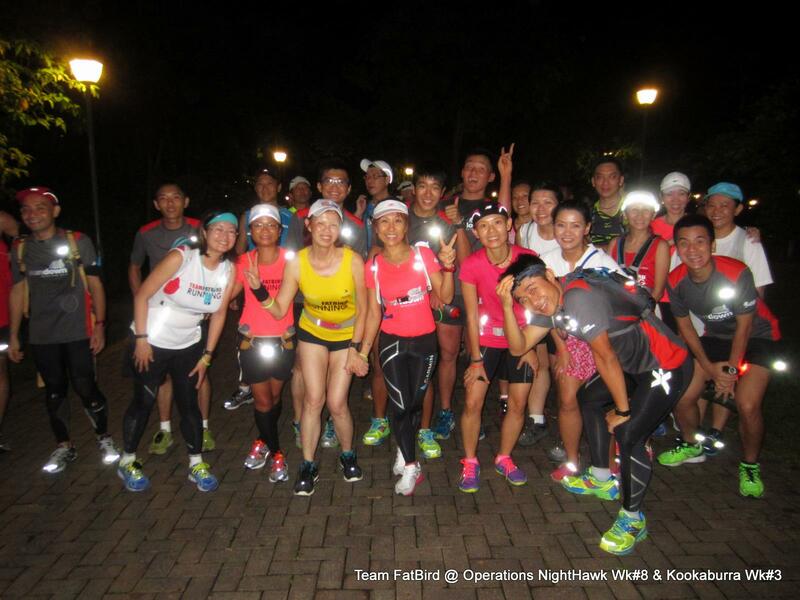 The Kookaburras were all excited about doing their longest run to date, and a night one to boot. 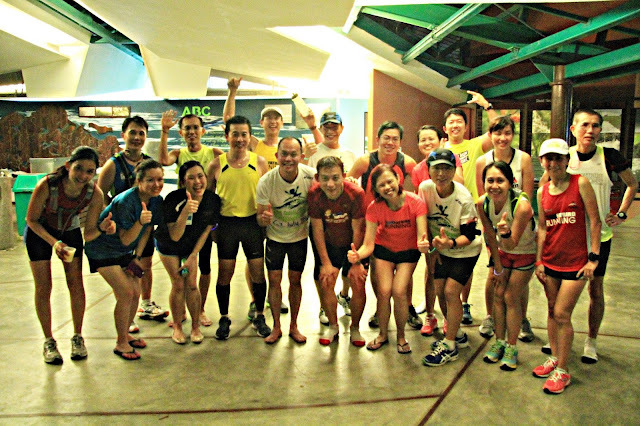 Into their 3rd week of training program, the trainees gathered at the MacRitchie Reservoir (MR) Amenities Centre with their respective pace group trainers and guides on what was a relatively cool evening. 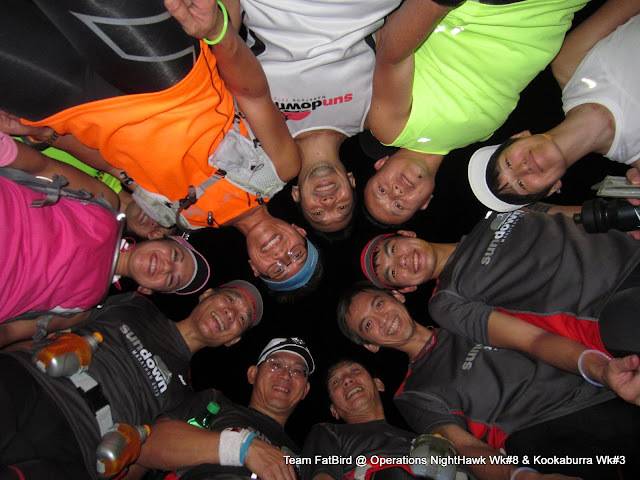 The training briefing was kept short to get the run underway as we expected a long night of pounding the pavement and connectors. 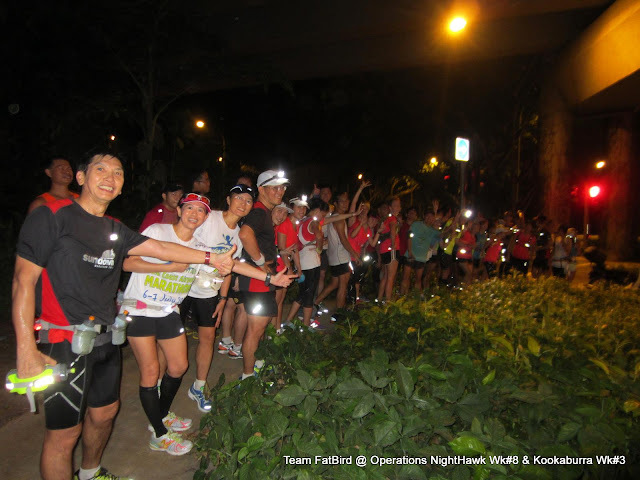 With all the blinking lights and watches set, we were flagged off in our respective groups and headed in the direction of Pierce Reservoir Road. 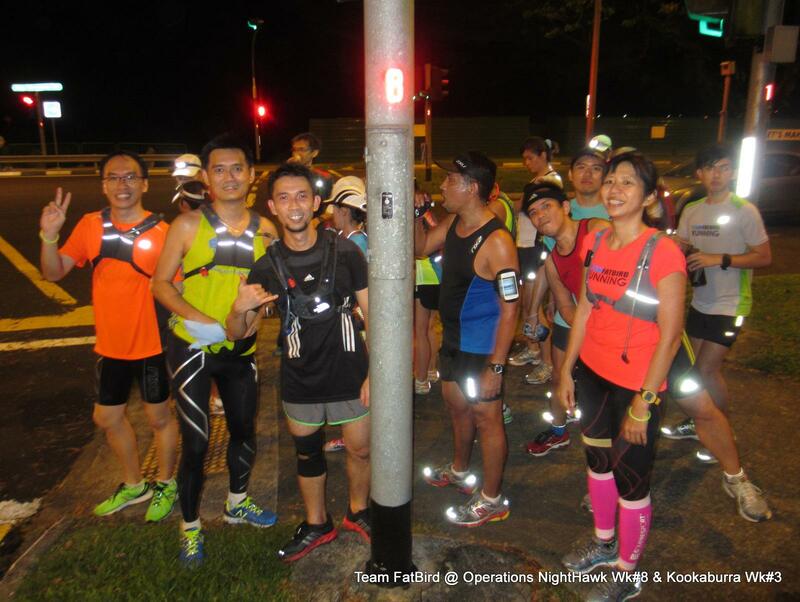 It was great to see that most participants had hydration and fuel belts on them, and we didn't spot a single headphone on any of the trainees - good observance of the night safety training protocol. 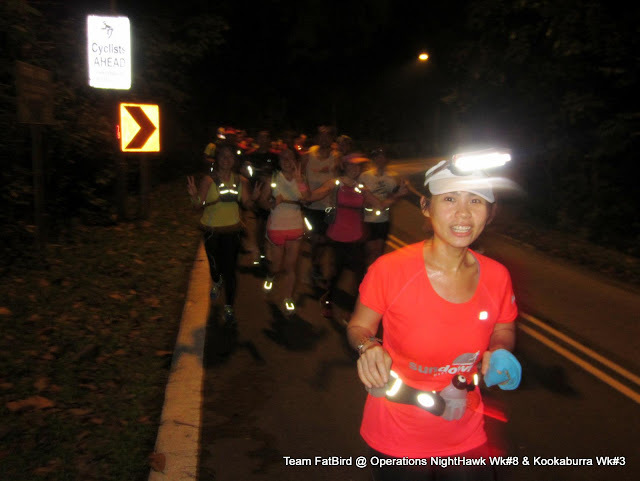 The run along Thomson Road, Pierce Reservoir Road, Old Upper Thomson Road (OUTR) was pretty smooth with the good marshaling by the Pacers and Running Guides. The Kookaburra HM were the ones to U-turn first at the end of OUTR (to/fro 16km). The rest of the groups proceeded on along Upper Thomson Road and then Sembawang Road. The Kookaburra Full Marathoners proceeded along Mandai Ave, still pacing along nicely in their respective groupings. Kookaburra FM made a turn at the SLE flyover (to/fro 25km) with their respective guides. 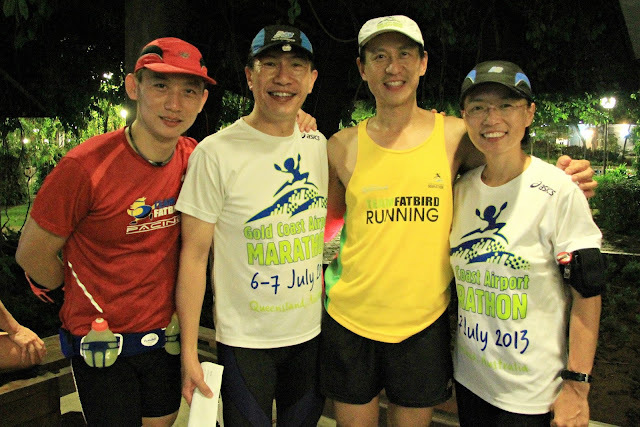 Target Marathon Pace (MP) were well maintained by the runners all the way on the return. 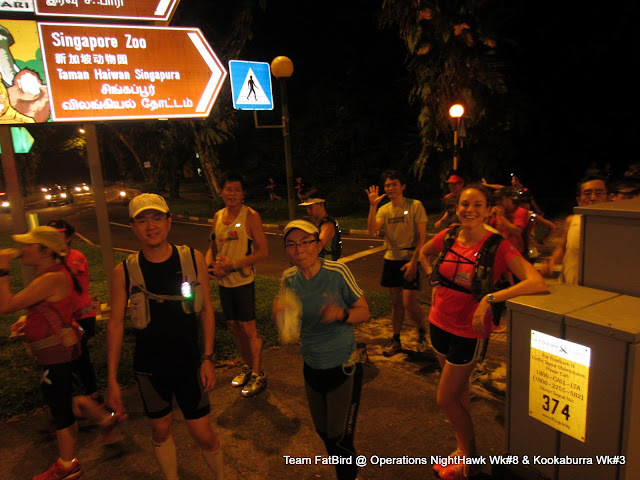 It was not till 18km that some of the runners were feeling the effects of low glycogen stores and insufficient hydration. 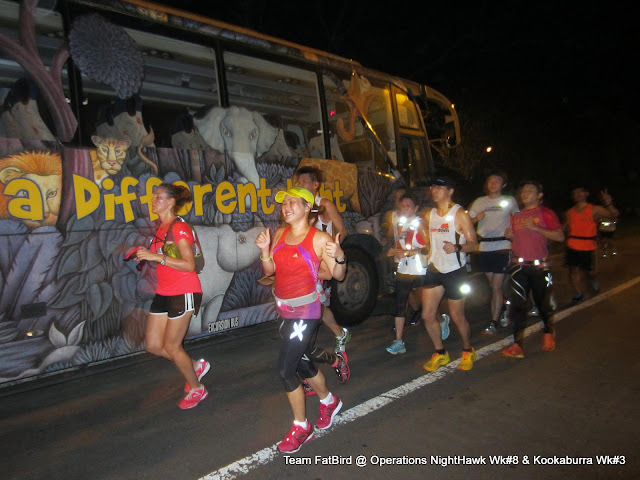 The Pacers and Guides made a few quick stops for the runners to get drinks from the stores - a run-saver as it allowed the effects of the marathon 'wall' to be delayed. 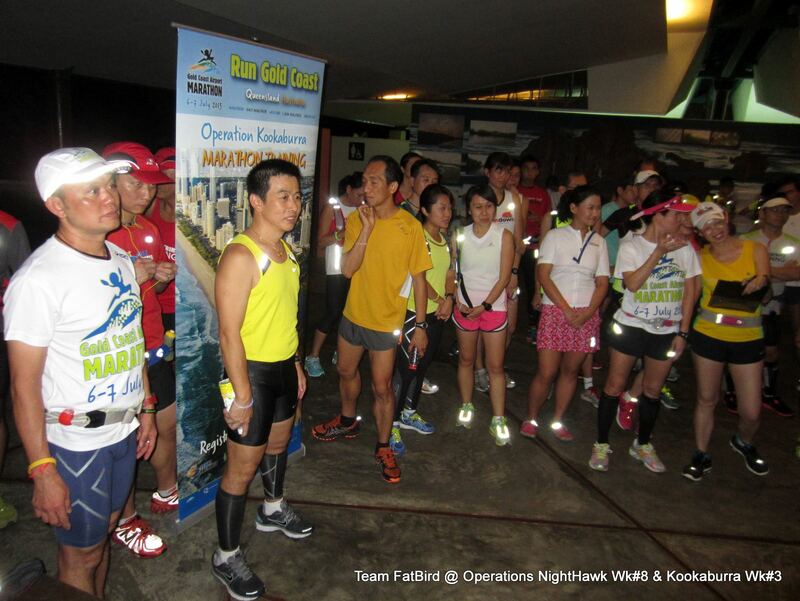 enabling the runners to continue to sustain their paces for more km. 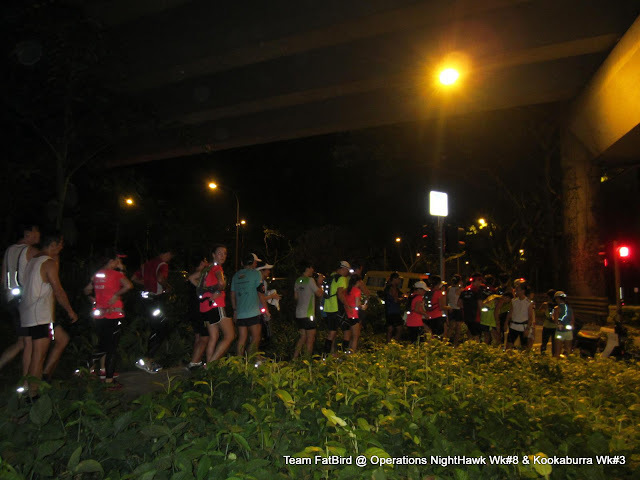 The run back along OUTR was one of quiet and calm in the serenity of the night. Flanked on both sides by forests, it was cool and away from the bustle of the road traffic. Running along this stretch in groups certainly help the trainees to push through the 'mental' states as well as offering good company and safety. 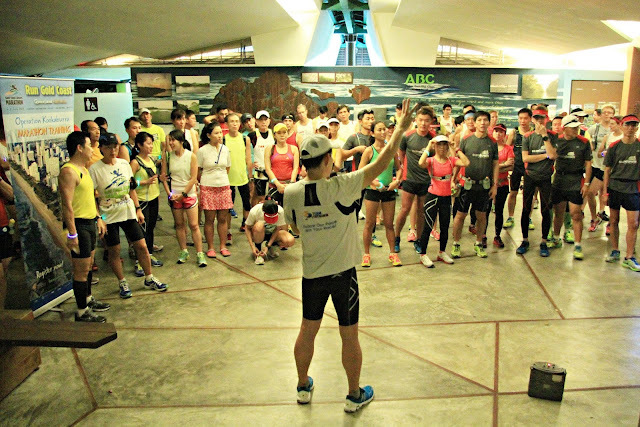 A final quick pitstop was made at the Pierce Reservoir toilet, before finishing the final 4km back the the MR Amenities Centre. 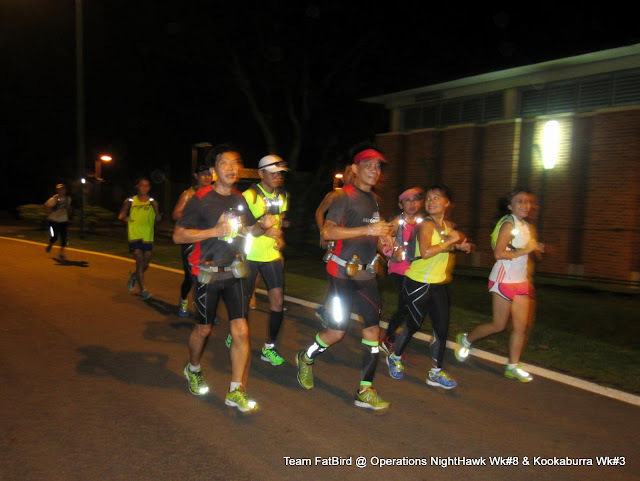 It was sweet relief and a great sense of satisfaction for many of us to have made the night's objectives (16km-25km distances @ MP), and we might not have done it without the good leadership of the group Trainers and Pacers coupled with cool, crisp weather. 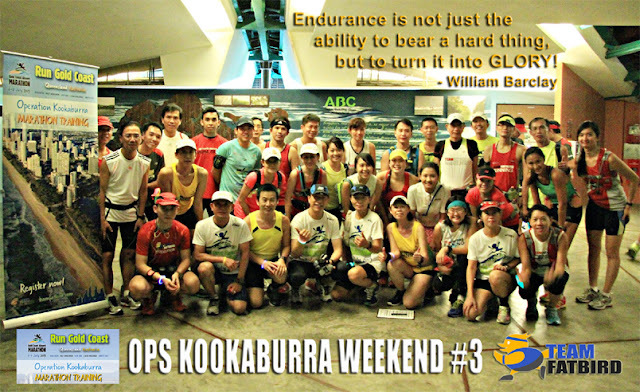 The Kookaburras did well in their basebuild mission, and they will be looking forward to face-face group LSD with Team FatBird in a fortnight.